Spring in Pennsylvania means muddy dogs and handlers. The DC Weim Club's annual Spring Hunt Test was a busy one, and we're just sharing a few shots from between braces. It was the sort of day that sells a lot of Muck brand boots. A young shorthair, already a Senior Hunter, waits in the mud with his handler before his first ever Master run. That's liver ticking AND mud decorating that GSP. Judges, Marshals, Handlers, Gunners, Dogs and the Gallery gather before the first Master Hunter brace of the morning. The first brace sets off on their Master run, with the morning's judges on horseback behind. The handlers are carrying shotguns, but only as props. Once they're in the bird field, they'll lift those guns as if shooting, while the gunners do the actual gunning. That's to make sure the dog's steady when a gun comes up. 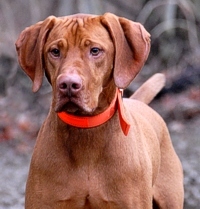 A Vizsla intensely eyes a chukar partridge. Gabby the Spinone methodically runs shifting loops across the cover on a blind retrieve. Got it! That chukar was a tough find on the wet ground near a tree-line. Tootsie the Brittany splashes her way back to Roy, her handler, with a downed chukar she's retrieved from a big ol' mud puddle. Meena, a young Pointer, is checking out the staging area at the Senior/Master field. She seems to find the box of quail more interesting than the box of chukar. 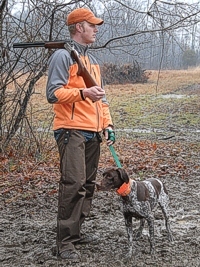 A chukar, pointed by Shelby the GSP and flushed up by Keith, his handler, meets a rather instantaneous mid-air demise in advance of a retrieve in the Master bird field. 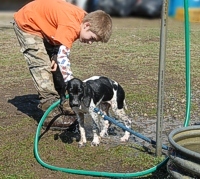 Back up at the clubhouse horse trough, a Pointer pup gets the Pennsylvania washed off. A little after-the-hunt-test romp and a rinse off in a nearby creek.